Young Robert O Lindsey grew up in rural Monroe county, Mississippi. During the depression, most families in this farming area did not know anything had happened during the stock market crash of 1929, mainly because in 1929, everything in Mississippi had been depressed before, during and after the crash. Robert O knew that plowing behind a mule, picking cotton & sweating 16 hours a day in a sharecropper's field was not something he visualized himself doing for the remainder of his life. He was not allowed to start the 10th grade due to the family's hardships. They had little food, no money, and he and his siblings wore mostly hand-me-down clothing from relatives. On the occasional weekend, his dad and he would hunt with a single shot 22 rifle, making squirrel and rabbit easy prey, and highly good eats. The winds of war were stirring and the Mississippi Gulf coast was bustling with shipbuilding activity. Robert O moved with his family to Pascagoula, Mississippi, with high hope of landing a job with the new Ingalls Shipyard. Shortly afterwards, both father, Samuel H, and son, Robert O, were hired on, with Robert O being sent to welding school for additional training. War broke out and by 1942 many were being drafted, depleting the male work force in Mississippi. By early 1943 it was obvious to Robert O that he was not going to be able to work at Ingalls throughout the war, so he (as did hundreds of others who hoped to avoid the Army) enlisted with the US Coast Guard. Before the Coast Guard was able to process so many applicants and call him into active duty, Uncle Sam's Army drafted Robert O. One of the last things he did before he left for basic training was to pat the brunette head of his younger sister's best friend, Lorraine Cooper, saying, "Young lady, when you grow up and I get back from the war, I'll look you up." Robert O had been with the Davis Crew from the beginning when it was formed by the Crew Assignment Center in Salt Lake City, Utah. He trained with them at Biggs Field, Texas, and at Alamogordo, New Mexico. He flew with them to England where he was credited with six combat missions, qualifying himself for an Air Medal. Upon returning from a mission on 10 June 1944, they received notice of transfer to the 44th Bomb Group for Pathfinder Training. Pathfinder planes have special equipment used for locating and bombing targets using radar navigation. Such planes enabled bomb groups to blindly bomb through the clouds with pinpoint accuracy. The fates of those in the Davis Crew is a mystery. After their arrival to the 44th, the paper trail regarding his crew is cold. For whatever reasons, Robert O ended up getting transferred to the 15th Air Force in Italy. 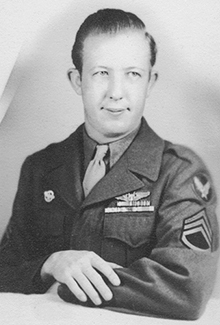 He was asssigned as an airfraft mechanic to the 484th Bomb Group, 826th Bomb Squadron, stationed at Toretto Airfield. He spent the rest of the war on the ground keeping 'em flying, repairing B-24s, C-47s and C-54s. After writing each other during the war, Robert O returned to Pascagoula, and looked up his little brunette pen-pal, who had indeed grown up while he had been gone. On Christmas Eve 1945, he and Lorraine were married at the residence of Judge Kate Denny, the only female judge in the state of Mississippi. The war had given Robert O a new trade in life. Between the years 1946 and 1958 he worked as a civilian airframe repairman for MOAMA at Brookley AFB in Mobile, Alabama. Still serving in the Air Force Reserve, he took a year leave of absence (1951 to 1952) to serve the Korean War. He was stationed at Feamcon near Tachikawa, Japan, working as an aircraft mechanic and airframe repair instructor. In May 1954, Robert O received his apprenticeship certificate as an "aircraft sheet metal, glass and plastic mechanic" thus increasing the value of his portfolio within the aircraft industry. In 1958 he went to work for the Army Ballistic Missile Agency at Huntsville, Alabama, as a sheet metal specialist. His job included working on the Redstone and Jupiter rockets that were responsible for Explorer I, Pioneer IV and with the successful launch and recovery of Monkeys Able and Baker. In 1960 his skill levels advanced him to a job in NASA's Marshall Space Flight Center, also located at Huntsville. He became part of the Mercury-Redstone, Mercury-Atlas, Saturn V and 1B/Apollo/Skylab programs. He retired in 1985. From complications due to congestive heart failure, Robert O passed away on 27 March 1992. Survived by his wife and two children, he was buried in Valhalla Cemetery, Huntsville, Alabama. Throughout his life Robert O Lindsey was a willing team player. Whether it was to drop out of school to help support his family, take the fight to the enemy, keep the planes flying or put men in space... he could be counted on to do his part. He was a true American hero in every sense of the word.